Frank Belford is a global Salesforce & Bullhorn for Force Consultancy Partner. We specialise within the Recruitment/Staffing Industry, helping small, medium and large recruitment companies to configure, develop, and enhance Bullhorn for Force products such as Talent Rover & Jobscience. Frank Belford is a leading Bullhorn for Force consultancy with capabilities in change & transformation, management consultancy, system strategy, technology and operations. Frank Belford inherently focuses on the Staffing, Retail & the Product Services Industry. The Frank Belford team has extensive experience with the Salesforce platform, underpinned by a broad range of certifications including those recognised by Salesforce. Our entire team have a vast amount of expert knowledge in staffing and related industries. This is a key differentiator for our business, as this helps us to understand not only the client journey and the technologies, but also the fine lines. Frank Belford works with your business through a discovery process to identify and document your business requirements, processes or changes. This method ensures the Bullhorn for Force implementation is optimised to meet your business needs and completed in an efficient manner. Investing time into the discovery process aids in mitigating implementation risks, reduces project costs, and reduces the time taken to implement the Bullhorn for Force solution. Seamless delivery on the Bullhorn for Force Platform. Frank Belford Enhances your Bullhorn for Force Platform to ensure you have a single solution to achieve a 360-degree view of client data and an uninterrupted view of your commercial lifecycle. The unobstructed flow of data ensures instant and accurate real-time updates, insights and reporting, while the powerful platform delivers unmatched staffing capabilities. With over 30 Custom Plugins specifically for the recruitment/staffing industry, we help to enhance the recruiters journey by enhancing functions surrounding relationship management, compliance, community, business development and contractor care. 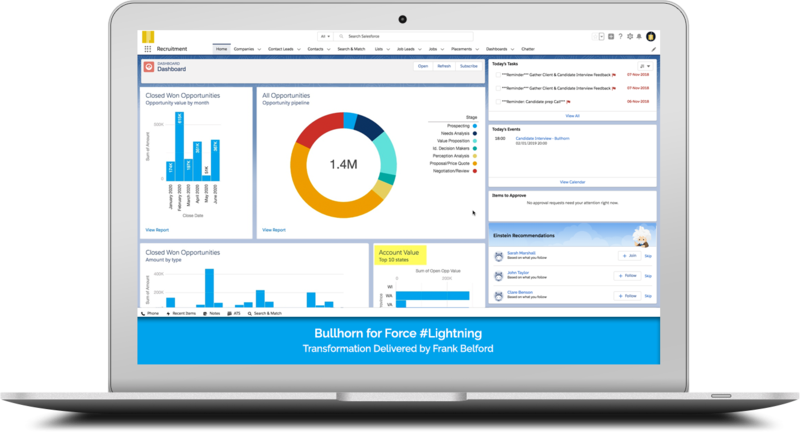 Frank Belford also offers a long list of integrations built and supported by Bullhorn for Force.